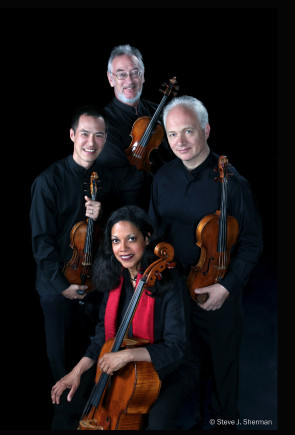 The Harvard Club of Naples cordially invites you to join us for cocktails at HobNob and then a performance by the Julliard String Quartet at the Sugden Theater! Please join us for cocktails at the HobNob Kitchen & Bar after which we will stroll across the street to the Sugden Theater to enjoy an evening of music featuring a program of Beethoven, Mozart & Dvorak performed by the Julliard String Quartet from the Lincoln Center in New York City. The Julliard String Quartet was first founded at the Julliard School in 1946 and has come to be regarded as one of the best quartets in the United States, winning numerous awards including four Grammys and membership in the National Academy Recording Arts and Sciences' Hall of Fame. As the Chicago Tibune notes, "Each of the four has a notably beautiful tone, a sound that sings out but also blends. They show an understanding of the music they play; every bow stoke adds to its meaning and its integrity." *Attendees will be able to get their tickets at the call window at the Sugden Theater on the evening of the performance.